Charles Lewis Camp assumed the Directorship of the Museum at a difficult time. W.D. Matthew had left the American Museum of Natural History three years earlier to serve as both chair of the Paleontology Department and Director of the Museum of Paleontology, doing much to heal the strife between the two units. But Matthew’s tenure was short, as kidney failure led to his death in 1930. His absence triggered a new round of dispute. Camp was Annie Alexander‘s choice for Museum Director and told UC President Gordon Sproul as much, but Sproul went ahead and appointed Ralph Chaney, Merriam’s preferred choice, instead. Alexander was convinced that Merriam and Chaney wanted to become involved in the Museum’s affairs and perhaps get access to some of the funding that she was providing to the Museum. She would have none of this. Alexander met again with Sproul, demanding that the Department and Museum be completely separate units, each with their own financing and staffs — if the University did not comply, she would withdraw her financial support. The University agreed and Camp was appointed the Museum’s Director while Chaney remained chair of the Department of Paleontology. Camp served as Director through 1949. Charles Lewis Camp was born in Jamestown, North Dakota, on March 12, 1893, of pioneer stock from whom he inherited the vigor and rugged independence which were among his outstanding characteristics. His family moved to Sierra Madre in southern California in 1895 where he attended Throop Academy in Pasadena. Camp learned at an early age of the fossil bones being excavated from the tar pits of Rancho la Brea by John C. Merriam, and of other facets of natural history on pack trips with his uncle. At Throop, Camp came to the notice of Joseph Grinnell. When Grinnell came to Berkeley as Director of the Museum of Vertebrate Zoology, he encouraged Camp to study zoology at Berkeley. In 1908 Camp visited relatives at Fort Bridger, Wyoming, giving him an opportunity to see the famous fossil localities of the Bridger Basin. Later that year at Grinnell’s invitation, he assisted Walter P. Taylor on a biological survey of the San Jacinto Mountains of Southern California. By the time Camp entered the University at Berkeley in 1911 he brought a significant collection of reptiles and amphibians from southern California to the MVZ. His studies of zoology while an undergraduate at Berkeley led to nine publications on herpetology and mammalogy and also a description of some fossil amphibian remains from the Rancho la Brea tar pits. As a graduate student at Columbia University and assistant at the American Museum of Natural History in New York City, he collaborated with William K. Gregory in studies of Comparative Myology and Osteology, particularly in restoring the musculature of Cynognathus. These studies were interrupted in 1917 by two years of military service in World War I. Camp attended the U.S. Army School at Plattsburgh, NY, was commissioned Second Lieutenant, Field Artillery, and served overseas in the American Expeditionary Forces, where he advanced to First Lieutenant. He was awarded the Croix de Guerre for his service as a forward observer, a duty which has been described, grimly, as giving you a good view of the war but not letting you live long enough to enjoy it. In World War II he served locally as an officer of the coast guard. Returning to Columbia, he produced an outstanding doctoral dissertation on the classification of lizards under the inspiration and guidance of William K. Gregory and Henry Fairfield Osborn. This work was a standard reference for several decades. In 1922 he was appointed to teach comparative anatomy in the Zoology Department at Berkeley and was also made a research associate of the newly established Museum of Paleontology. 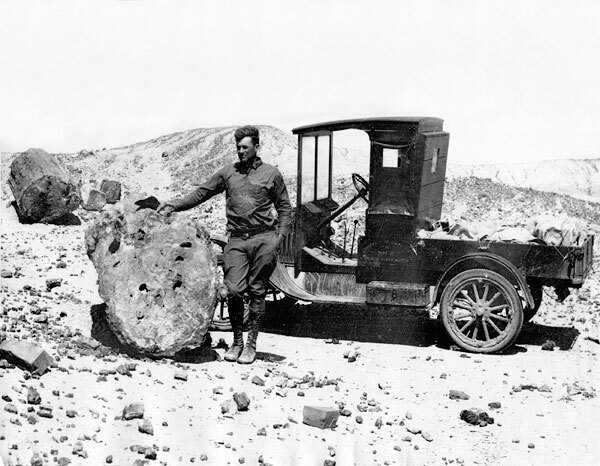 At this time he began field work in the Triassic deposits of the Painted Desert region of Arizona and this continued for many years, leading to his monographs of the phytosaurs (1930) and dicynodonts (1956). In 1930 he transferred to the Paleontology Department where he later served as chair from 1939-49 (succeeding Chaney). Following the appearance of O.P. Hay’s Second Bibliography and Catalogue of the Fossil Vertebrata of North America in 1929, Dr. Camp saw the need for the regular continuation of such a reference work, and also the importance of making it worldwide in scope. He began about 1933 to compile a bibliography of publications about fossil vertebrates since 1928, and enlisted the assistance of V.L. Vanderhoof and other students in searching and abstracting publications in the University of California libraries. Eight volumes, published by the Geological Society of America, appeared under his editorship between 1940 and 1972. 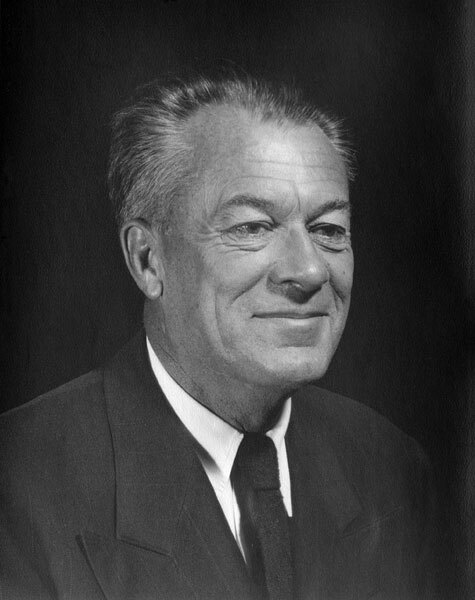 In 1935 a Guggenheim fellowship enabled him to visit the principal collections of Triassic vertebrates in Europe and South Africa, to collect from the Karroo beds, and to visit Triassic exposures in China with C.C. Young. His large collection of African fossils included the fine skull of Prolacerta, which he described in 1945, as well as representatives of most of the major groups of mammal-like reptiles. Camp’s students Sam P. Welles and Frank E. Peabody extended the scope of his investigations of the North American Triassic with their discoveries in the Moenkopi Formation, the Dinosaur Canyon sandstones, and Kayenta Formation. Early Permian localities in northwestern New Mexico yielded varied fossils which were studied by Wann Langston. Dr. Peabody accompanied Camp on a second expedition to South Africa in 1947-48. They collected from the Pleistocene limestone caves near Taungs and at other sites noted for the occurrence of primitive human fossils, as well as in the Permo-Triassic Karroo beds. This trip brought large collections of fossils to the Museum. In 1949 Camp relinquished both the museum Directorship and the chairmanship of the department to Ruben A. Stirton and devoted his efforts to the description of the large anomodont reptiles of South Africa and Arizona. 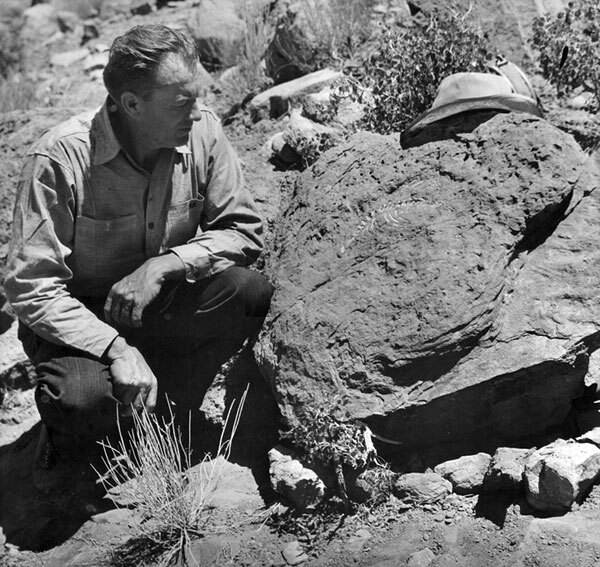 From 1953 to 1958 Dr. Camp devoted his summers to excavating giant ichthyosaurs from Triassic limestones of the Shoshone Mountains in Nevada; he persuaded the Nevada authorities to make the site a State Park where the skeletons have been left in the rocks to form an outdoor museum (now the Berlin-Ichthyosaur State Park). Following his retirement from teaching at the University in 1960, Camp visited Australia and made a successful search for fossil vertebrates in the western part of that continent. John Cosgriff, who accompanied him, has described the labyrinthodonts which they discovered and continued to work in this field. Camp’s early interest in myology and the functional relationships between bone and muscle reappeared in his important work with Natasha Smith on the phylogeny of digital ligaments of the horse, which examines the steps by which the specialized features of the unguligrade hoof arose. He also investigated locomotor mechanisms in rabbits and pikas with A. Borrell. Discoveries of marine reptiles in Cretaceous rocks of central California led to his monograph on California mosasaurs. As a teacher he stressed the study of original publications, the examination of specimens, dissections, and examination under the microscope. His lectures were spontaneous and were often more about responding to student questions rather than following a predetermined outline. Camp had an interesting way of emphasizing certain points by dropping his voice almost to a whisper. He gave his students free rein to follow their own interests, but he was always ready to offer wise counsel. He followed the careers of his students with interest, and was always ready to provide a helpful letter or other assistance. He was extremely generous in turning over his discoveries to his students for their research. He was extremely thorough and careful in his own research, frequently rewriting papers many times. An excellent extemporaneous speaker, he had a great sense of humor, and fitted comfortably into any society. In the field he maintained the interest of assistants with lively conversation and stories on the most diverse topics. Some of this wisdom was set down in his Earth Song, a poetic interpretation of the geologic history and prehistory of western America, in Stories of Fossils, prepared for elementary school children, and in Desert Rats Remembered by Charles L. Camp. While a graduate student in New York City, Camp used to wander into antiquarian book stores in search of odd books and pamphlets for recreational reading. Here he met Henry R. Wagner of the California Historical Society who encouraged him to prepare a manuscript account of Kit Carson’s explorations in California for publication in the Society’s new “Quarterly.” This appeared in 1922 and was followed by numerous accounts of western pioneers and major books on James Clyman (1960) and George C. Yount (1966). As with his paleontological work, he endeavored to check every detail by retracing the tracks of these pioneers across the plains and mountains. Mr. Wagner entrusted him with the revision of his 1920 bibliography of The Plains and the Rockies, which Camp edited in 1937, again in 1956, and a fourth edition in press at the time of his death. Camp was a member of the society’s board of directors from 1922-33 and of its publications committee, 1922-35. In presenting the Henry R. Wagner Medal of the California Historical Society to Charles Camp in 1970, Professor Rodman W. Paul of the Department of Humanities of California Institute of Technology said: “So impressive has been Dr. Camp’s output in Western History and so long has it been maintained that the oncoming generation of young scholars often fails to realize that Western History has been Dr. Camp’s avocation rather than his profession … [he] is the author of many papers that deal with such unhistorical subjects as lizards, frogs, toads, reptiles, rodents, salamanders, and dinosaur bones. Unlike most of us, Dr. Camp has managed to live simultaneously and successfully in two scholarly fields.” In 1968, Berkeley had presented Camp with an honorary doctorate for having achieved eminence in two careers — scientist and historian. Camp was a Fellow of the American Association for the Advancement of Science, the Geological Society of America, the California Academy of Sciences, and E Clampus Vitus, the historical preservation fraternity and social club. Charles L. Camp died of cancer in San Jose, California, on August 14, 1975, at the age of 82. Read more about Camp and see additional photos in Part 5 of Jere Lipps’ six-part series on the history and development of UCMP. The UCMP archives also contain the papers of Charles Camp which can be accessed by historians and researchers. Content from Joseph T. Gregory’s September 1996 UCMP News newsletter article; from an obituary written by Gregory and Samuel P. Welles housed in the UCMP archives; from 1977, University of California: In Memoriam authored by Gregory, George P. Hammond, George R. Stewart, and Welles and issued by the Academic Senate; and from an August 14, 1975 release from the UC Office of Public Information. All Camp photos from the UCMP Archives.